Spacious three-bedroom, two-bathroom condo that can comfortably accommodate a family of seven. This classic-chic vacation home has everything guests could need to relax between activities. 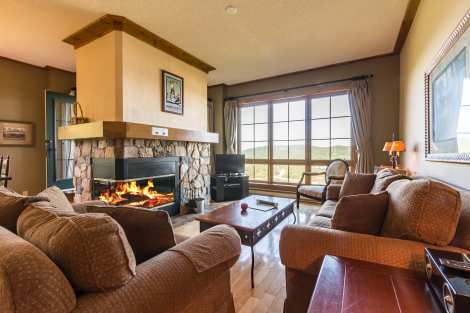 Comfort is ensured by air conditioning, heated tiles, a two-sided wood-burning fireplace and two balconies overlooking the valley and Tremblant Lake. The kitchen is fully-equipped for making delicious meals. Chefs-in-training can even take a seat at the bar-style counter to watch you cook! In the living room, two cushy sofas face the fireplace. The master suite has a king-size bed, large balcony and a full bathroom with whirlpool tub. The second bedroom has a queen-size bed and the third has a bunk bed sleeping three. Amenities also include wireless high-speed internet, two TVs with DVD players and a compact sound system.